This past week, I nearly hit an older man with my car as he walked on a snowy Minnesota road. He was walking while reading a book. It was shocking enough to see him on the tight shoulder, but when I tried to make eye contact with him to reassure him I didn’t plan to mow him down, it was then I realized he was too glued to his book to notice. It wasn’t a small book either. It was a textbook-sized distraction that worried me enough I watched him in my rearview mirror to make sure he made it over the snow-covered bridge. Within the same hour, I found myself taking a second glance at the engrossed 11-year-old girl who sat reading her book in the loud, chaotic hockey rink during a game. What were these people doing? Hasn’t someone told them there are all sorts of other places more conducive to reading? I venture to guess neither of these people would name a frigid roadside or a bustling hockey bleacher as their favorite places to read, but maybe they like the white noise of a rink or the life-gamble of reading in close proximity to speeding cars. I didn’t have a chance to ask them. National Book Award winner William Alexander prefers to write in near darkness. Where is your favorite place to read or write? Does your local coffee shop get your creative juices flowing? Prefer to read at the lakeshore? What sorts of places provide the most inspiration for you as a writer or a book lover and why? “It has to be quiet for me to write and to read. Most of the time, I write at home sitting by the fireplace with my laptop in my lap. Other times, I will go to a park on a pretty day. Sit by a beach or even someplace public—but alone. When an inspiration hits, I try to grab that moment, wherever it takes place. It’s my opinion that writing is a personal journey, and in some respects reading is, as well. When you read, it’s like inhaling a fragrance—what it says to you, may be totally different than what it says to me. It can take you places in your imagination, memories or fantasy. It stimulates your brain in ways nothing else can. From the writer’s perspective, it is setting that fragrance loose that is inside you, revealing it to others who wish to join you in your journey. What about you? Where do you enjoy reading and writing? Keep the conversation going. We love it when Readers Write. I need a quiet and organized space to write. Working on my novel, I have my notes, drafts and everything else I need within inches of my laptop. My office window provides an inspiring view of the valley and river beyond. When I finish a major writing project, I often reward myself with a mini-writer’s retreat. My favorite place? 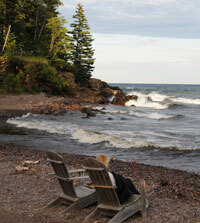 The north shore of Lake Superior with a fire crackling, waves rolling in and a hot cup of coffee. Sounds fabulous, Diane. Thanks for sharing your process.